Navy sailors aboard the USS Halsey salute the USS Utah Memorial in Honolulu, Dec. 7, 2016. 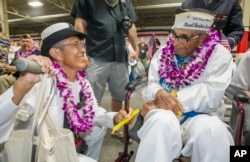 What was billed as the last big gathering of survivors of the Japanese attack on Pearl Harbor took place Wednesday in Hawaii – 75 years to the day after the bombing that brought the United States into World War II. Thousands stood and clapped when a few dozen survivors joined active duty servicemen and women and National Park Service rangers in dedicating wreaths to those killed. About 2,400 people died that day, most of them members of the U.S. Navy. The ceremony started with the USS Halsey sounding its whistle to mark the start of a moment of silence at 7:55 a.m. - the same moment Japanese planes began their assault on December 7, 1941. F-22 fighter jets broke the silence when they flew in formation overhead. Kathleen Chavez, left, talks with her father, Ray Chavez, age 104, of the USS Condor, the oldest living survivor from the Pearl Harbor attacks, along with the remaining living survivors of the USS Arizona gathered at the World War II Valor in the Pacific National Monument at Joint Base Pearl Harbor-Hickam in Honolulu, Dec. 7, 2016. “For U.S. military men and women, especially because we are in Japan today, it’s a chance to reflect on the sacrifices of those who have come before us,” General Stephen Lanza, commander of the Army’s I Corps based on the U.S. West Coast, told VOA Wednesday. The remembrance comes amid annual U.S. military exercises with Japan, a once bitter enemy turned strong ally. In the exercises, dubbed Yama Sakura, the U.S. and Japanese work together to fight various simulated threats. Lanza, who leads the U.S. contingent in Yama Sakura, said the exercise reinforces the alliance with Japan and builds trust between the two militaries. Each year the U.S. Army pairs with one of Japan’s five armies for Yama Sakura operations, and this year the U.S. is collaborating with Japan’s Western Army. The war game is normally conducted by the nations’ ground forces, but the 2016 war games also include coordination among with the countries’ naval and air forces. The aim is to better synchronize joint operations in the event of an attack. 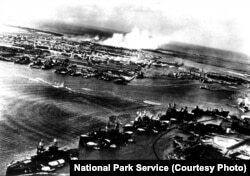 This year’s exercises come ahead of a historic event later this month, when Shinzo Abe becomes the first Japanese prime minister to visit the Pearl Harbor memorial to those who died in the aerial raid. But those who expect Abe to apologize are likely to be disappointed. “The purpose of the upcoming visit is to pay respects to the war dead, not to offer an apology,” Chief Cabinet Secretary Yoshihide Suga said in Tokyo. The Japanese prime minister, who visited U.S. President-elect Donald Trump last month in New York, is concerned about a possible weakening of the U.S.-Japan alliance under the new administration, according to Koichi Nakano, professor of Japanese politics at Tokyo’s Sophia University. “So he is doing all he can to send signals that U.S.-Japan relations are strong and indispensable,” Nakano told VOA. This image was captured by a Japanese naval aviator in the opening moments of the attack on Pearl Harbor. Torpedo tracks can be seen headed towards Battleship Row. Smoke rises in the distance from the burning aircraft and hangars at Hickam Field. But many of Abe’s supporters “don’t want him to apologize or say anything near an apology,” Roy told VOA. “Apologies are not necessary,” according to Tetsuo Kotani, senior fellow at the Japan Institute of International Affairs. Abe, he said, only needs to express remorse for those who suffered and died in the human tragedy and express a sincere commitment to peace. 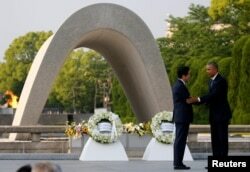 The Hawaii visit by Abe will be an “appropriate complement to President Obama's visit to Hiroshima this past summer. The message is that Japan acknowledges its past, and that it is ready to move forward,” said retired U.S. Air Force Brigadier General Dave Stilwell. Abe’s visit to Pearl Harbor will come just weeks prior to the inauguration of Donald Trump as the 45th U.S. president. Trump has questioned the fundamentals of America’s military alliances with Japan, South Korea and NATO. U.S. President Barack Obama (R) puts his arm around Japanese Prime Minister Shinzo Abe after they laid wreaths in front of a cenotaph at Hiroshima Peace Memorial Park in Hiroshima, Japan. May 27, 2016. But General Lanza told VOA military leaders he has worked with in the Pacific, including Japan, are looking for U.S. leadership. “I think our presence matters,” Lanza said, adding that a U.S. military presence helps with other militaries’ growth, professionalism and readiness.